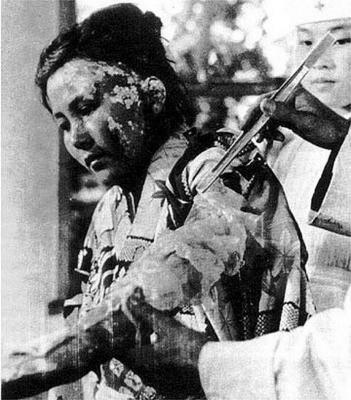 Atomic bombing victims suffered terrible burns, for which treatment was largely unavailable and inadequate. We know that the detonation of a nuclear bomb creates temperatures that cause serious burns in those affected. Even though there have been significant improvements in the treatment and survival of burn victims, burns are very painful, and every second or third degree burn injury that affects more than 10-15 % of the body surface is in acute need of intensive medical care. The skin is an almost perfect barrier in both directions; it hinders foreign substances and microorganisms from getting into the human body, and also keeps fluids and important electrolytes from leaking out of the body. The skin is well supplied with blood through a fine web of capillaries, and has a lot of sensitive nerve endings everywhere. When you get burned, cells of the skin and the tissue beneath get destroyed and the barrier function gets lost. When superficial (epidermal) layers of the skin are burned, we talk about a first-degree burn. It is red and painful, but otherwise not so dangerous. When deeper layers of the skin are affected we talk about second-degree burns, and when tissue beneath the skin, like connective tissue, blood vessels and muscles, are also affected, we talk about third-degree burns. The big killers in cases of second and third degree burn injuries used to be, and still are, burn shock and infections. By a burn shock the burned skin loses its ability to keep on to body fluids resulting in severe circulatory problems. Burned skin also loses its inherent immunological protection and is very vulnerable to infections. Beside the affected skin area and the question of availability of medical care, the age of the patient and any concurrent inhalation injuries are also factors crucial for the survival of burn victims. Inhalation injuries, which deteriorate the prognosis, occur when the victim also inhales irritating and/or toxic gases from fires that are likely to occur in case of a nuclear detonation. Under normal circumstances, the treatments for burn victims have improved during the last decades. Due to better control of infections, better substitution of fluids end electrolytes, and some newer surgical methods, the survival of burn victims has improved. According to figures from the US, one half of patients under 60 years of age who have no inhalation injury can survive with as much as 70% of their body surface burned. That is, of course, if they have access to intensive medical care. But, for those who survive, serious burns leave extensive and deep scars. Second and third-degree burns represent a serious and life threatening health problem in need of intensive medical care. Everyone who visits the Hiroshima peace memorial museum can see that thousands and thousands of the atomic bomb victims suffered from very serious burns with no possibility for adequate treatment and help in the acute phase. It is both immoral and criminal to develop and maintain weapons that can cause such harm to humans. Therefore, the only possible solution is to free the world from the inhuman nuclear weapons and have them prohibited.